Instagram is the last shining star. With the accelerating acceleration after the acquisition of Facebook, the number of active users increases day by day, and we see how effective the statistics are from the web. Every day I was faced with someone saying "I am selling through Instagram". Everyone now has a store on Instagram, showing it on Instagram and selling it through Whatsapp. Instagram has become a great channel for small businesses. Where's the problem? Instagram is on its way to becoming a trash can because of our greed. Let me tell you a little bit about what happens. The use of hashtags has been very influential when instagram is not known to anyone yet. People using Instagram were using the hashtags carefully. The ecosystem provided the hashtags like #tbt (now meaninglessly used) to enter my life. As the ecosystem grows, more and more people are starting to manipulate these hashtags. Especially at that time the influence of the hashtags on the past diluted the mouths of people. When you edit a post you posted a year ago or comment and enter a new hashtag, you can go to the top of the page on the hashtag and get more visibility and appreciation. The abuse of this Instagram prevented this feature. Well done. However, because of the hundreds of articles written at that time, people can still spend hours on the hashtags. 90% of Hashtag uses are insignificant I can say. 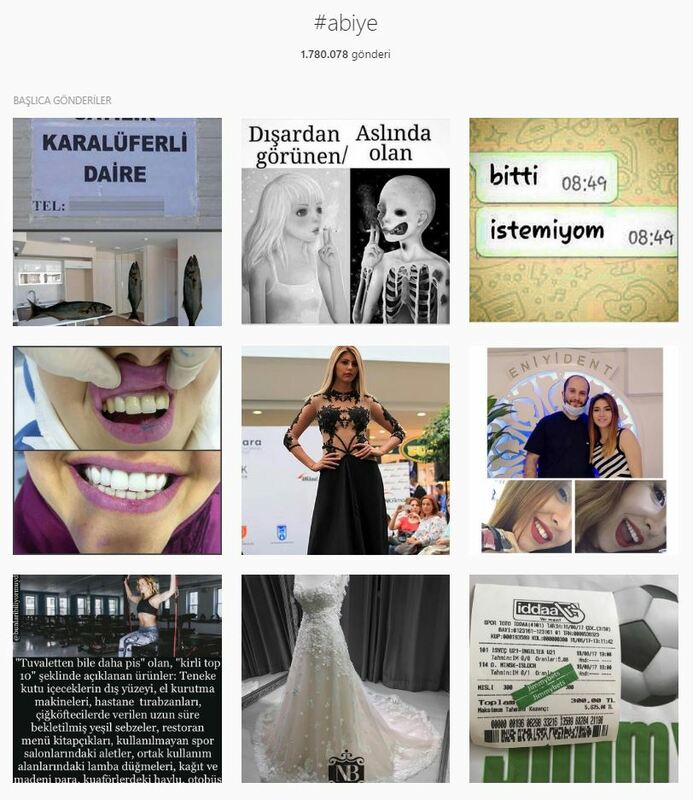 Below you can see the most liked posts when searching for #furniture and #hash hashtags as an example. Almost no one has anything to do with the matter. Well what does it mean? At first glance you can say. The guy who calls it furniture, sees the send of the dentist and maybe decides to make his teeth. I have my luggages, but there is a situation like this; these senders are not real people, they are all bot. 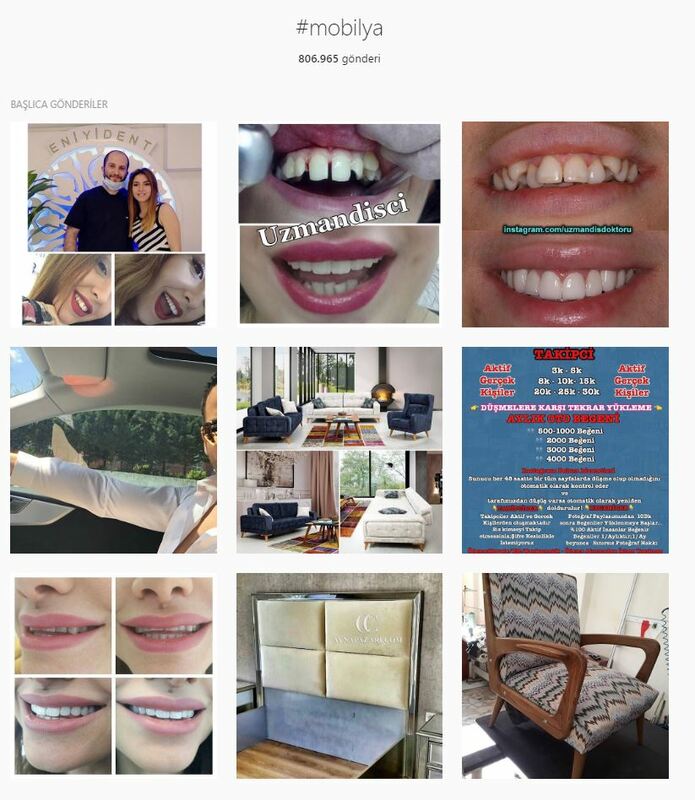 The furniture hashtagine is also the bot that will like the photos of the dentist who gives the photo. Because the bot accounts are aimed at hashtags which are frequently used for followers and likes, and they are automatically playing. So boots like boots. There is nothing real in the middle. Automatic feeds are printed in fake or bot accounts so that these senders are among the main senders. Thus, an account of 5000 people may have liked the first send of a newly opened account. The followers are fake, likes are fake ... Do not those who manage these brands ever think? Why am I in Instagram? Let's go back to the account first time. "I will sell something out of Instagram." But there is nothing more to do than to sell something in the landing point, but to make a few boilerplate writings. There are also agencies that implement this. I do not give names now. These agencies are fooling customers with false pleasures. Customers are woken up, just as the number of followers increases, you can ask if you have uploaded. That's why every sender is automatically acclaimed. These likes are distributed on an equal basis so that people are not aware of the absurdity. Those who do not meet with the situation may not be able to visualize in full head. For this reason, I must give an example. 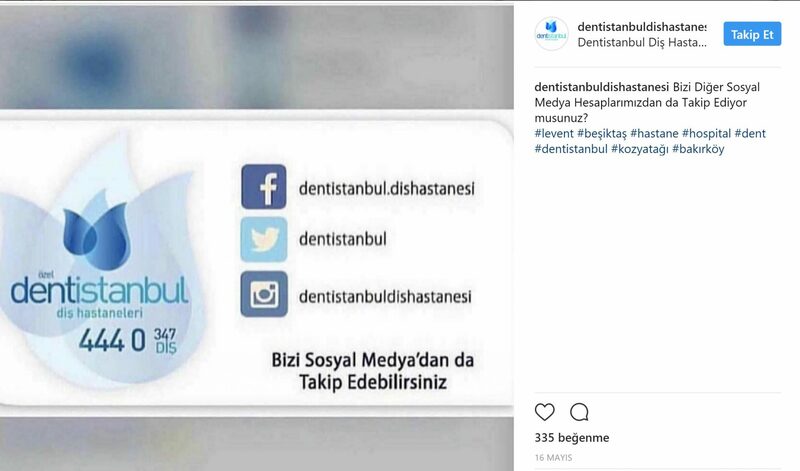 I came to the account of Dentistanbul Dental Hospitals. The account looks like a shy 11bin follower, and on average, every shipment receives 300 votes. So far everything is normal. However, I notice some anomalies as I look towards the old ones. Designed with a dishwasher and not a Photoshop, this shipment is inspired by 335. Why do people like this post? Let's say I like it. Now let's look at these two visuals. Visual is the same visual. There is only 21 days difference between them. One received 20 accolades while the other received 327 accolades. There is no change in the number of followers in the relevant date range. 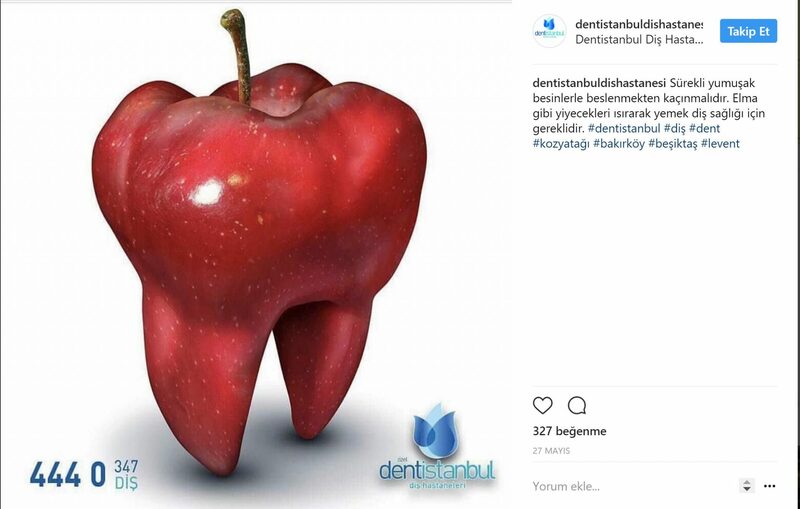 Dentistanbul is just one example. You can easily find thousands of similar accounts. I wrote this article for those who trust in fraudulent. The effort you really spend and the money goes to garbage. Social media is to increase your awareness of your brand, to sell, not to appreciate it. I can understand once more that a person's account is playing games like this to make friends. 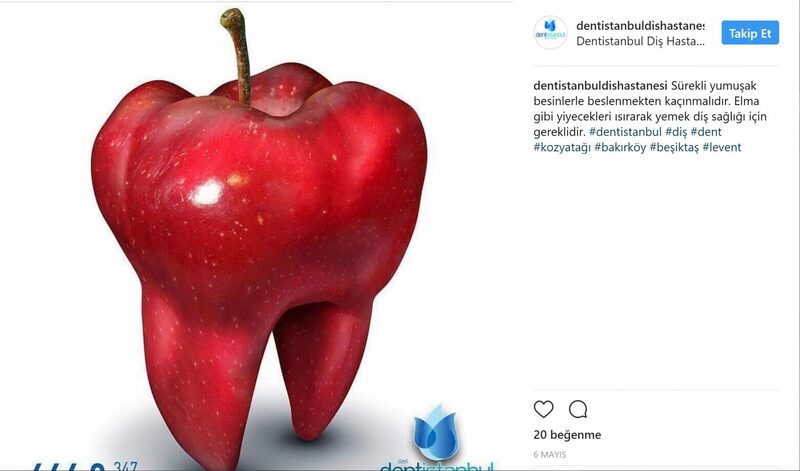 I can only give a psychological description, but it is really incredible that a brand is doing it, it is deceiving customers. It's not just about deceiving, it really does not work. Because at the end of the day you have not reached the real person. Dear social media experts, if you want your customers to post false followers, send this article. See how frustrating your brand is and you will not waste your time. I hope Instagram will return to those good old days as soon as possible. I wish you showed the brand as flu. Trouble can occur. 🙂 I do not think it's a problem, normally the mark should thank you, but let's see. I already have so many digital platforms and applications that my personal opinion is that people will now continue to have social media activity, but I predict that the effective and in-depth time span of the users will decrease or even decrease. Here comes the essence of the follower. Social Media Facebook, Instagram, SnapChat, tvitter etc. I think companies are experiencing the so-called bell curve, that is, they are experiencing vertical upsides and now they are going horizontally waiting for tomorrow. If the content is going to Suggested Senders by rate of follower, I think there is no objection. The article was exactly what I wanted to tell you. It's the greatest argument, people who think that the rest is not important if I'm on the discovery. However, since this process is done with fake accounts, you can discover fake accounts. Explore personally changes. I think they buy automatic bot followers on purpose. They are trying to make their company look like a popular company. Most of the users of instagram are already pure unconscious people, but as you say, slow, slow people are awakening. I hope this will bring an instagram solution because if you do not bring a rubbish channel will be a short time later, such as facebook and twitter in the case of a new application, I will lose popularity. It's a very beautiful article. I think the misuse of the labels is the most upsetting of me. It takes a lot of time to find what I want because of these absurd uses. You forgot to put the #ads tag when starting the production. The content is correct but contains ads. There's no sin to fool followers, do you? What kind of ad does it contain? A very thorough observation and analysis are clearly explained. We also have a similar analysis in our AdWords account. We take 5 clicks, 3 days sales, 70 ticks and ask for something. The essence will not satisfy the philosophical belief that only the friends, who do not reach the goal, are in exchange.